The MCAT Self Prep, a service offered by Self Prep LLC, is dedicated to developing and maintaining a friendly online community, where members of backgrounds feel relaxed and comfortable. Like any community, The MCAT Self Prep website has certain standards. When members use the MCAT SELF PREP website, located at https://www.mcatselfprep.com, they agree to abide by these rules. To remain a part of MCAT SELF PREP, members must be considerate to others. Repeated violations of these standards may result in a member being temporarily suspended or barred from entry or participation in MCAT SELF PREP’s Site. BY ACCESSING OR USING MCAT SELF PREP’S SITE, YOU AGREE TO BE BOUND BY THESE TERMS OF SERVICE. IF YOU DO NOT WISH TO BE BOUND BY THE TERMS OF SERVICE, YOU MAY NOT ACCESS OR USE MCAT SELF PREP’S SITE. MCAT SELF PREP, IN ITS SOLE DISCRETION, MAY MODIFY THESE TERMS OF SERVICE AT ANY TIME. AN EMAIL WILL BE SENT TO YOUR REGISTERED E-MAIL PROVIDING A) A SUMMARY OF THE CHANGES MADE TO THE TERMS OF SERVICE AND B) A THE FULL TEXT OF THE NEW TERMS OF SERVICE. YOUR CONTINUED ACCESS OR USE OF MCAT SELF PREP’S SITE SHALL BE DEEMED YOUR CONCLUSIVE ACCEPTANCE OF THE MODIFIED AGREEMENT. You must be at least thirteen (13) years old to use MCAT SELF PREP’s Site. Children under the age of thirteen (13), or legal guardians acting on their behalf, are strictly prohibited from using MCAT SELF PREP’s Site. You represent and warrant that you are at least thirteen (13) years of age and that you possess the legal right and ability to enter into TERMS OF SERVICE and to use MCAT SELF PREP’s Site in accordance with these TERMS OF SERVICE. The sale of advertising, sponsorship, or promotions, including links placed to such, in MCAT SELF PREP’s Site. However, this does not include non-paid opinions and reviews of products, schools, and etc. The linking and/or reposting of any content or material delivered from MCAT SELF PREP’s Site to any webpage that contains advertising, which would include an ad-enabled blog. Otherwise selling and/or profiting, or permitting others to profit, from MCAT SELF PREP’s Site and the content and materials therewithin. All content and material taken in accordance with these TERMS OF SERVICE from MCAT SELF PREP’s Site, except where otherwise noted, must be licensed to others under a Creative Commons Attribution-NonCommercial-NoDerivs 3.0 Unported License, which is available at <http: http://creativecommons.org/licenses/by-nc-nd/3.0/us/>. (d) is offensive or otherwise unacceptable to MCAT SELF PREP and its mission statement. ANY MESSAGES, ADVICE, OPINIONS OR OTHER INFORMATION PROVIDED ON OR THROUGH MCAT SELF PREP’S SITE SHOULD NOT BE CONSTRUED AS PROFESSIONAL OR MEDICAL ADVICE OR INSTRUCTION. 3.2 All content or materials posted on or shared through MCAT SELF PREP’s Site are the sole responsibility of the user. MCAT SELF PREP shall assume no liability or responsibility for user-posted materials, including, but not limited to, copyright violations or defamatory statements. (p) Attempting to decompile, reverse engineer, disassemble, or otherwise interfere with or damage MCAT SELF PREP’s Site. This includes, but is not limited to, the circumvention of any technological protection measures such as user authentication or password-protected material and content on MCAT SELF PREP’s Site. 3.4 Registered users may send and receive electronic mail (“email”), engage in conferences and chats, download and upload files and otherwise use MCAT SELF PREP’s Site as permitted by these TERMS OF SERVICE and applicable law. MCAT SELF PREP may review e-mails if notified by a third-party as to inappropriate content, as specified in 3.1, or a violation of these TERMS OF SERVICE. MCAT SELF PREP considers its users’ privacy to be of the utmost importance. Please see our Privacy Statement for a detailed description of our information gathering and dissemination practices for the MCAT Self Prep Web site. MCAT SELF PREP TAKES NO RESPONSIBILITY FOR THIRD-PARTY MATERIALS, WEBSITES OR AGREEMENTS. Certain content, products and/or services offered through MCAT SELF PREP’s Site may include materials from third parties or links to other websites. MCAT SELF PREP does not warrant or endorse, does not assume, and will not have any liability or responsibility for any third-party materials or websites, agreements or any other materials, or products or services. Links to other websites are provided solely as a convenience to you. 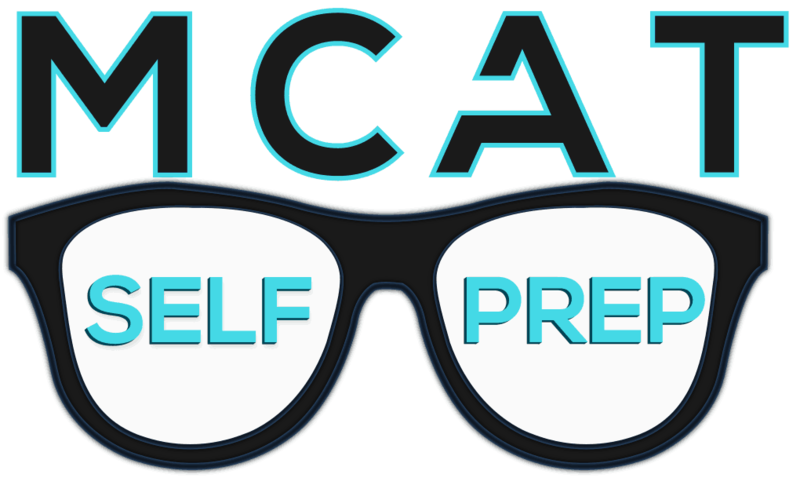 Content and materials posted on MCAT SELF PREP’s Site by users and third parties, and links or downloads thereof, reflect only the views of their authors and do not necessarily reflect those of MCAT SELF PREP. Furthermore, MCAT SELF PREP makes no warranties or representations that users will not find such content and materials inappropriate or offensive. The entire contents of MCAT SELF PREP’s Site are copyrighted as a collective work (“Work”) under the laws of United States and other copyright laws. MCAT SELF PREP holds the copyright in the Work. The Work includes works which are the property of the Information Providers, which may also be protected by copyright and other intellectual property laws. Except where otherwise noted, content on this site is licensed under a Creative Commons Attribution-NonCommercial-NoDerivs 3.0 Unported License. YOU AGREE TO INDEMNIFY, DEFEND AND HOLD HARMLESS MCAT SELF PREP, ITS OFFICERS, DIRECTORS, EMPLOYEES, AGENTS, INFORMATION PROVIDERS AND SUPPLIERS FROM AND AGAINST ALL LOSSES, EXPENSES, DAMAGES AND COSTS, INCLUDING REASONABLE ATTORNEY’S FEES, RESULTING FROM ANY VIOLATION OF THESE TERMS OF SERVICE OR ANY ACTIVITY RELATED TO YOUR ACCOUNT (INCLUDING INFRINGEMENT OF THIRD PARTIES’ WORLDWIDE INTELLECTUAL PROPERTY RIGHTS OR NEGLIGENT OR WRONGFUL CONDUCT) BY YOU OR ANY OTHER PERSON ACCESSING MCAT SELF PREP’S SITE USING YOUR ACCOUNT. YOU AGREE THAT NEITHER MCAT SELF PREP, NOR ITS OFFICERS, DIRECTORS, EMPLOYEES, AGENTS, INFORMATION PROVIDERS OR SUPPLIERS, SHALL HAVE ANY LIABILITY TO YOU UNDER ANY THEORY OF LIABILITY OR INDEMNITY IN CONNECTION WITH YOUR USE OF MCAT SELF PREP’S SITE. YOU HEREBY RELEASE AND FOREVER WAIVE ANY AND ALL CLAIMS YOU MAY HAVE AGAINST MCAT SELF PREP, ITS OFFICERS, DIRECTORS, EMPLOYEES, AGENTS, INFORMATION PROVIDERS OR SUPPLIERS (INCLUDING BUT NOT LIMITED TO CLAIMS BASED UPON THE NEGLIGENCE OF MCAT SELF PREP, ITS OFFICERS, DIRECTORS, EMPLOYEES, AGENTS, INFORMATION PROVIDERS OR SUPPLIERS) FOR LOSSES OR DAMAGES YOU SUSTAIN IN CONNECTION WITH YOUR USE OF MCAT SELF PREP’S SITE. NOTWITHSTANDING THE FOREGOING PARAGRAPH, THE TOTAL LIABILITY OF MCAT SELF PREP, ITS OFFICERS, DIRECTORS, EMPLOYEES, AGENTS, INFORMATION PROVIDERS AND SUPPLIERS, IF ANY, FOR LOSSES OR DAMAGES SHALL NOT EXCEED THE FEES PAID BY THE USER TO MCAT SELF PREP FOR UP TO ONE (1) YEAR FOR THE PARTICULAR INFORMATION OR SERVICE PROVIDED. IN NO EVENT SHALL MCAT SELF PREP, ITS OFFICERS, DIRECTORS, EMPLOYEES, AGENTS, INFORMATION PROVIDERS OR SUPPLIERS BE LIABLE TO YOU FOR ANY LOSSES OR DAMAGES OTHER THAN THE AMOUNT REFERRED TO ABOVE. ALL OTHER DAMAGES, DIRECT OR INDIRECT, SPECIAL, INCIDENTAL, CONSEQUENTIAL OR PUNITIVE ARISING FROM ANY USE OF THE INFORMATION OR OTHER PARTS OF MCAT SELF PREP’S SITE ARE HEREBY EXCLUDED EVEN IF MCAT SELF PREP, ITS OFFICERS, DIRECTORS, EMPLOYEES, AGENTS, INFORMATION PROVIDERS OR SUPPLIERS HAVE BEEN ADVISED OF THE POSSIBILITY OF SUCH DAMAGES. The provisions of paragraphs 7 (Indemnification) and 8 (Waiver, Release and Limitation of Liability) are for the benefit of MCAT SELF PREP and its officers, directors, employees, agents, licensors, suppliers, and Information Providers. Each of these individuals or entities shall have the right to assert and enforce those provisions directly against you on its own behalf. Either you or MCAT Self Prep may terminate your right to use MCAT SELF PREP’S Site at any time, with or without cause, upon notice. MCAT SELF PREP may terminate, suspend, temporarily disable, and/or limit your services to MCAT SELF PREP’s Site without prior notice due to violation of these TERMS OF SERVICE. The provisions of paragraphs 7 (Copyright), 3 (License), 8 (Indemnification), 9 (Waiver, Release and Limitation of Liability), and 10 (Third Party Rights) shall survive any termination of this Agreement. Any cause of action or claim you may have with respect to MCAT SELF PREP’s Site must be commenced within one (1) year after the claim or cause of action arises. MCAT SELF PREP’s failure to insist upon or enforce strict performance of any provision of these TERMS OF SERVICE shall not be construed as a waiver of any provision or right. Neither the course of conduct between the parties nor trade practice shall act to modify any provision of these TERMS OF SERVICE. Specifically identify the material or link you are claiming to be infringing or the subject of infringing activity that is to be removed and information reasonably sufficient to permit MCAT SELF PREP to locate the material. Providing clear URLs is the best way to do this. Submit your physical or electronic signature. To sign electronically you may begin and end your name or initials with a “forward slash” (“/”). For example, Bob Q. Smith could electronically sign /BQS/ or /Bob Q. Smith/.